Mega Millions lottery: Where does lottery money go in different states? When many people think of how lottery winnings are spent, images of new mansions or lavish yachts and flashy cars zoom through the minds of jackpot hopefuls. Most don't think of the paths in Colorado parks, or the classrooms of Florida public schools, or senior centers in Pennsylvania, but those are all lottery winners in their own ways too. The specific lottery systems differ in each state, but each state donates a percentage of the revenue generated from ticket sales to their own causes. "Lottery revenues are allocated differently in each state, with determinations made by state legislatures. In many states, the money goes to public education, but some states dedicate it to other good causes," said Carole Bober Gentry, a spokesperson for the Maryland lottery and Mega Millions. One lucky state could be in for a bigger windfall depending on the results of Tuesday night's historic Mega Millions drawing, now that the jackpot is set to $1.6 billion. 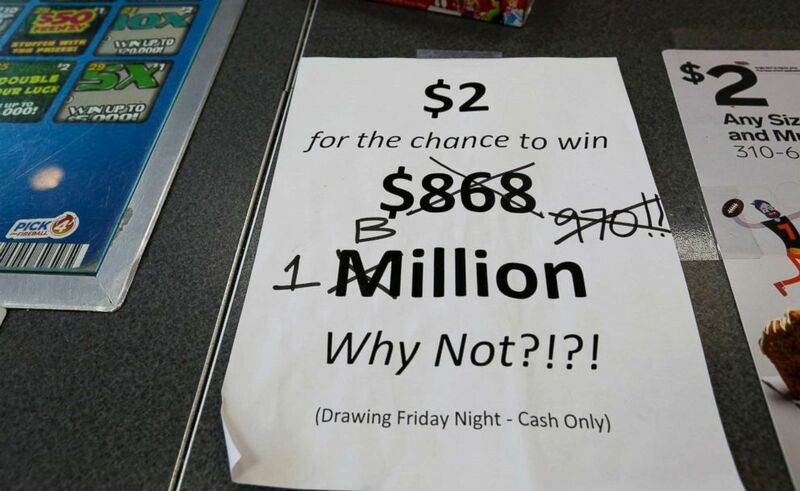 An updated paper sign is displayed the counter of a 7-Eleven store shows that the Mega Millions estimated jackpot has soared to $1 billion, as the second-largest prize in U.S. lottery history gets even bigger, Oct. 19, 2018, in Chicago. As the exact cause differs by state, so does the percentage that it recieves, but Gentry was able to give a rough breakdown of how the Mega Millions pot will be split. "For Mega Millions (and Powerball) tickets, 50 percent of the sales goes to the prize pool. The remaining 50 percent is used to pay for the states' retailer commissions, vendor fees, lottery administration, and the state beneficiaries or good causes of that state," she told ABC News. According to the PA Lottery, since 1972 the lottery has led to $28 billion in funding that supports programs geared towards seniors and older residents. In Colorado, the charitable funds are split among various organizations and trusts dedicated to preserving the state's wildlife, being spent on parks, pools and trails. "So in a way, every time you play a game from the Colorado Lottery, you’re actually giving someone in our state the chance to play," the state's lottery website reads. 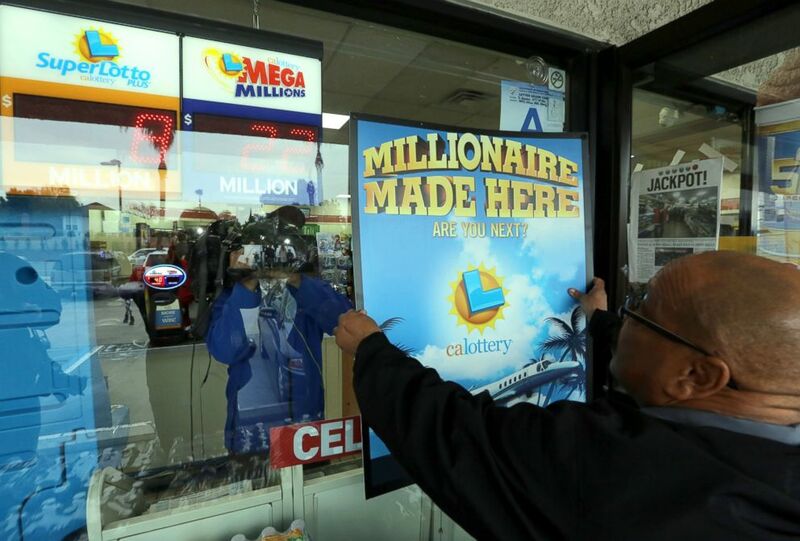 California Lottery Representative Terry White posts a "Millionaire Made Here" lottery signs in the window of the Chino Hills 7-11 store where one of the winning Powerball tickets was sold, Jan. 14, 2015. Florida sends an undisclosed amount of their lottery ticket purchase funds to the state's Educational Enhancement Trust Fund which is then dispersed based on decisions made by the state's legislature with input from the Florida Department of Education, according to the Florida Lottery website. Texas is another state that counts education as one of the good causes that receives lottery funds. According to the state's lottery website, they've contributed $22 billion to a public education fund since 1997. 27.1 percent of the funds the state earns from ticket sales is directed towards the fund, According to the Texas Tribune. Since 2009, the scratch-off ticket sales have benefited veterans' assistance, contributing more than $101 million in that time. For this latest doozy of a Mega Millions jackpot, there are 44 states and two territories -- D.C. and the U.S. Virgin Islands -- that participate, and in a way, they're all winners, according to Gentry. "Every state's benefiting from the brisk sale of the tickets," Gentry said. Where does lottery money go in different states?